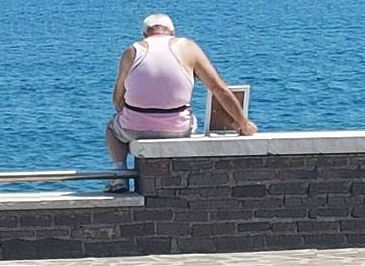 Just as Italians are readying for summer’s beach and daily ‘gelatinos’, they were reminded of an act of pure ‘amore’ when Mr Matteo Salvini, their new Interior Minister and currently the most popular politician, tweeted a picture showing an elderly man at the beach. Without explaining what it was about, he simply added three hearts and a link. The photo, which was taken by Mr. Georgia Moffa at the beginning of the month, was snapped in the city of Gaeta in central Italy and since been posted on Facebook. Mr. Moffa, speaking to local newspapers who have taken an interest in the story, says the elderly man is 70-year-old Mr. Giuseppe Giordano, whose wife, Ida, died seven years ago. The story goes that Mr. Giordano met Ida when he was only 16 and she was 17. In that time, Ida eventually fell pregnant and the couple, being the scandal of the small village, married against their parents’ wishes. Back in 1969 having a child out of wedlock was still a big thing in Italy. The loved-up pair stayed together for all years to come, leading a long, quiet life. However, in 2011, disaster struck as Ida fell ill and later passed away. His neighbors explained that: “He can't stand to be without her, and with that framed photo, he takes her everywhere and keeps her close as his most precious thing." I see the word noble when I look at this man's actions.